Yes. And no. 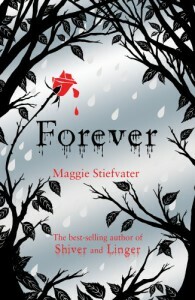 I cannot decide whether "Forever" is too different and too drastic compared to its predecessors. While "Shiver" and "Linger" lacked action, "Forever" seems to lack serenity. I did not find any quotes I would like to cling to, or any profound moments of love I wanted to take part in. For once, Stiefvater's writing seemed superficial. I did however like the very scientific take on the wolves, and Cole's experimental cure. I was thrilled when the book seemed to promise closure and hope, and disappointed when it stopped too abruptly. Perhaps "Shiver" should just have been a stand-alone book, a concluded and closed story told as an achingly sad, sincere and lyrical fairy-tale. It seems that Stiefvater's plot is just as fragile as Sam Roth himself, and therefore should have been handled more delicately. We all know that a butterfly easily can be crushed and turned to dust, when you grasp it too tightly.